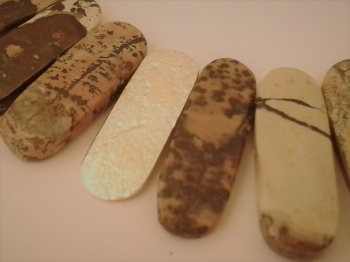 ST460 Weathered Agate beads with sterling silver 'flying saucers'. Adjustable 22" to 25"
ST456 Dumortierite beads with silver 'Flying Saucers'. ST464 Picasso Jasper pillow shaped beads with small round beads and silver 'pillows'. ST495 Sodalite matt beads with silver 'flying saucer' beads. ST499 Green Jasper rectangular beads with small round silver beads and 3 silver textured pillows. ST537 Lapis Lazuli pillow shaped beads with textured silver beads same shape. ST535 Lapis Lazuli and silver coin shaped beads. ST522 Apple Jasper cylindrical beads with textured silver beads the same shape. ST517 Outback Jasper and honey Jade beads with textured silver cylindrical hand made beads. ST523 Dumortierite pillow shaped beads with textured silver ones hand made to reflect same shape. ST617 Black agate stone beads with silver textured rondel beads. 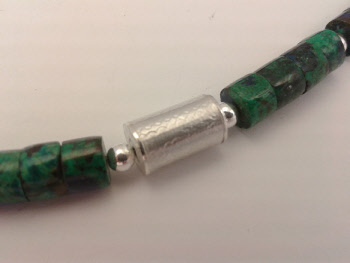 ST624 African green jasper with silver textured beads and silver hook and chain. 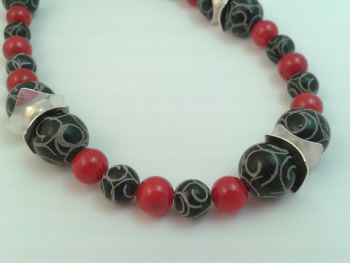 ST644 Black carved burnt Jade and red Sea Bamboo with silver domed washers. 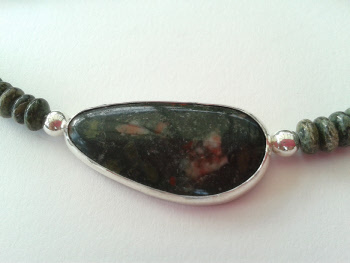 ST618 Picasso Jasper beads with silver square washers and silver hook and chain. Variable length. ST699 Banded agate long tube shaped beads with same size hand made silver textured beads. ST700 Sodalite beads (much bluer than photo) with textured hand made silver beads, silver hook and adjustable chain. 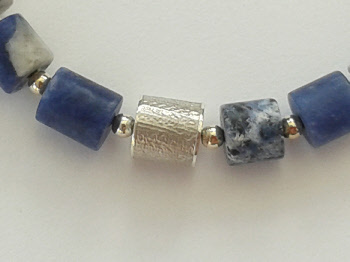 ST671 Sodalite tube beads with hand made silver textured ones and silver hook and chain. 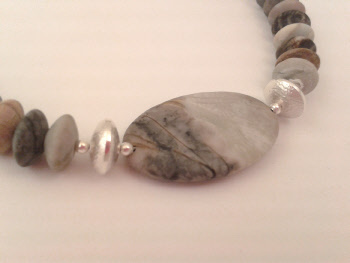 ST677 A Serpentine cabouchon set in silver threaded with Leopard Skin Jasper beads and silver. ST650 Picasso Jasper beads, Oval, Rondel and tube with silver hand made beads. ST744 Leopardskin Jasper, oval and tube beads with a single hand made silver oval textured bead. 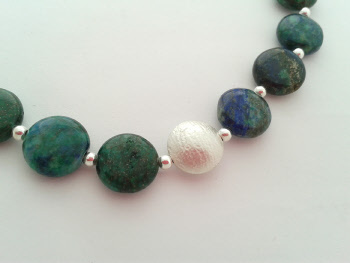 ST755 Azurite tube beads with hand made silver textured beads. ST780 Coral pillow shaped and tube beads with hand made silver textured tube beads.